This Committee reports on the various exhibiting and literature awards given by the Society. 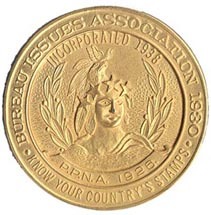 Statue of Freedom medals presented at APS World Series of Philately shows, and President’s Award medals given at local and regional shows, are periodically reported in The United States Specialist. The Hopkinson Literature Award for the best article published in The Specialist, and the Southgate, Hopkinson and Cleland exhibiting awards are presented at the Society’s annual meeting, along with the Brett Service Award.